SC Photo Contest – And the Winners Are! The votes are in and – voila! – here are the photo contest winners for Allendale, Calhoun, Marion, Jasper, and Union counties. SCIWAY sends a hearty "thank you" to everyone who submitted a photo to our contest. Each of the five winners will receive a check for $50. We also really appreciate all of you who took the time to vote – over 1,800 in all! We hope to have another South Carolina photo contest soon, so if you have an idea for a good theme, just let us know. Gorgeous scenery, historical monuments, Southern cuisine, live entertainment! Soak in the local flavor of each town with guided garden tours, hikes, kayaking trips, and shopping in some of the best antique districts in the South. Bring your appetite and prepare to sample some of SC's famous and finest Southern cuisine. Each night will feature entertainment ranging from a live soul band, beach music, an outdoor movie night, a Jimmy Buffett cover band, and much more. A five-day event that boasts street dances, a golf tournament, a beauty pageant, a baseball game, an arts and crafts sale, and a parade. 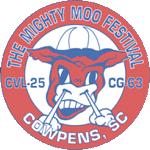 The festival is a time for the townspeople to celebrate their history and to honor the veterans and crewmen of the USS Cowpens CVL 25 and the USS Cowpens CG63. Want to see the full calendar? Just click here to check out SCIWAY's complete calendar of June SC events! Also, remember that all of our event calendars, for every month of the year, are available on SCIWAY's website 24/7/365 – just go to https://www.sciway.net/calendar.html.